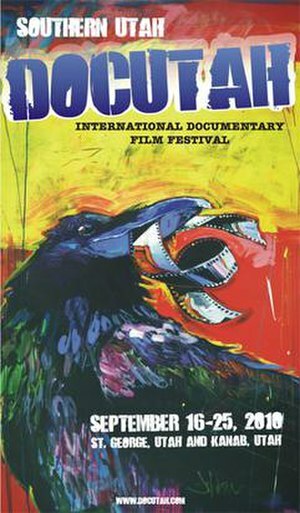 Yesterday I was fortunate to attend a splendid documentary film at Docutah, in Saint George, Utah. The film runs 70 minutes and documents a trek in the Himalayas to promote preserving the environment. 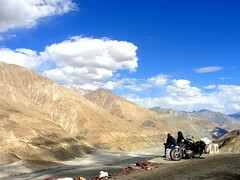 Approximately 700 people trekked to Ladakh in the Kashmir area of northern India/Pakistan. Along the route, they collected trash to leave the area cleaner than they found it. Environmental degradation in the Himalayas is slowly poisoning the source of the fresh water relied on by about half of the world’s population. They also tried to teach the population of the area they traversed about why the climate is changing and how to preserve their homes and crops from violent storms and resulting landslides. The trek in summer, 2009, tranversed snow fields and crossed a pass above 17,000 feet. The film’s producer, Wendy Lee, was there after the film to answer questions. In Santa Barbara, the California coastline runs nearly East-West rather than North-South. In the picture above, the sun rises in the upper right near the shore and sets off the picture in the lower right in the Pacific Ocean. When I was an x-ray tech at Cottage Hospital, I sometimes worked shifts that started at 6am or 7am and my duties included x-raying patients in their beds first thing in the morning. I always started on the top floor, the 6th, because it gave the best view of the morning sunrise. 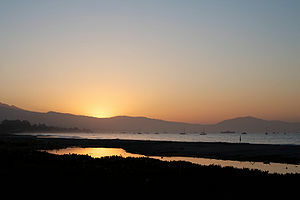 I enjoyed my work and a Santa Barbara sunrise was an excellent way to add a bit more pleasure to the job. The picture below is a sunset taken from my present home in Saint George, Utah. I like to say that I moved from one saint to another, Santa Barbara to Saint George.